Mother and Baby..... Translucent and shimmering hand painting sets off this Polar Bear design. Beautiful hand blown multi-colored glass reflects off the glass surface and is accented with hand worked metal. Each bead and texture created one at a time. The unique shape of the lid is our own design. It is raised with angled sides. This not only enhances light reflection, it also makes it much more durable by dispersing pressure and strengthening the hinge. The colored lid is attached to a base made of hand cut beveled sides and a mirrored bottom. This clear base allows light to enter from any direction. The mirror bottom illuminates the beauty of all objects placed within it and will also illuminate the colored lid. The box looks like it has been lighted from within and direct sunlight creates a beautiful prism rainbow effect. Heirloom quality and signed by the artist. A completely unique treasure box designed to last a lifetime. 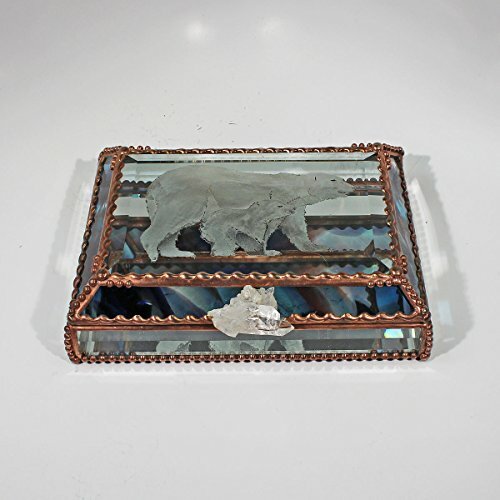 Size 5" x 7" x 2"
If you have any questions about this product by Glass Treasure Box, contact us by completing and submitting the form below. If you are looking for a specif part number, please include it with your message.